The Mets had a 7-5 lead entering the 9th inning last night with Jeurys Familia coming in to try and close it out. Of course Familia loaded the bases. With one out and Bryce Harper coming up, Terry Collins yanked his closer in favor of subpar chunky lefty Josh Edgin. 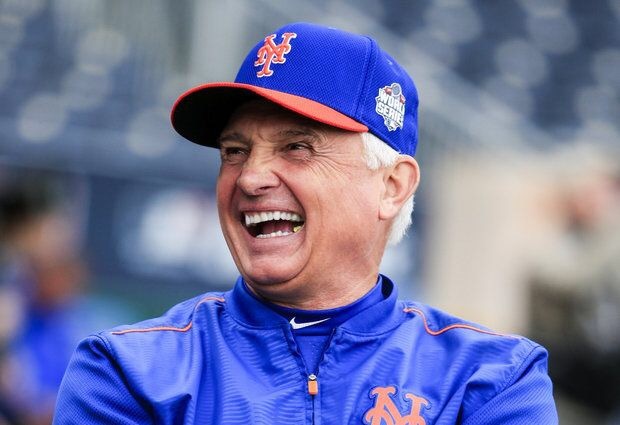 Terry Collins decided to go with the lefty on lefty matchup even though Bryce Harper crushes every type of pitcher and Jeurys Familia is our ace out of the pen. But somehow Terry’s plan worked. Harper hit the ball right back to Edgin for a 1-2-3 double play. I’m not even going to question Terry’s insane decision making on this night. The Mets won a game they desperately needed to win, and that’s all that matters. Travis The Great: Travis d’Arnaud was the MVP last night hitting a two-run homer in the second inning and a three-run shot in the fourth. Somehow with everyone going down due to injury d’Arnaud has found a way to stay on the field. I feel like he has sucked the life force out of the rest of the team in order to preserve his own fragile body. Need Jacob: Jacob deGrom outpitched Max Scherzer. He gave up 3 runs on 6 hits over 7 innings and struck out 12. Terry put him on the mound for the 7th inning despite having over 100 pitches, and I’m totally in favor of the move. We need our aces to pitch seven innings. The pen just can’t be trusted. Nats Poo Pen: Speaking of bullpens that can’t be trusted, the Nationals pen imploded in the 8th inning. Jose Reyes doubled, T.J. Rivera reached on an error by Ryan Zimmerman, and Travis d’Arnaud was walked to load the bases. Then the Nats gave up an RBI single up the middle to Kevin Plawecki. I didn’t even realize he was still on the roster. Then they walked Michael Conforto and forced in the seventh run. Seriously Zimmerman? : What the hell is going on with Ryan Zimmerman? The guy hasn’t done a damn thing since 2013. I thought him and David Wright were heading down the same road to early retirement. Last night Zimmerman hit a solo bomb in the second inning and a two run jack in the 8th inning off Addison Reed. He hit his 9th and 10th home runs of the season in April?!? If the Nationals have Daniel Murphy, Bryce Harper AND Ryan Zimmerman competing for the MVP the NL East “race” is already over. Today: Zack Wheeler faces Steven Strasburg this afternoon. Tomorrow Noah Syndergaard is supposedly pitching. He said yesterday the Mets asked him to get an MRI, and he refused. Lol. On the one hand, it’s smart to do the opposite of whatever the Mets training staff tells you to do. So I respect his choice from that perspective. On the other hand, his bicep was aching, and he said he couldn’t lift his arm this week. I’m sure it will all work out of great. Zack Wheeler should be rebuilding his skills at AAA or AA. Saturday’s game shows he’s not quite ready for the big show.